Soap Box Derby Mickey takes the lead in this action-packed design by artist Jim Shore! The handcrafted piece is hand painted in a vivid mix of ultrabright colors, with lightning details and geometric folk-art motifs. 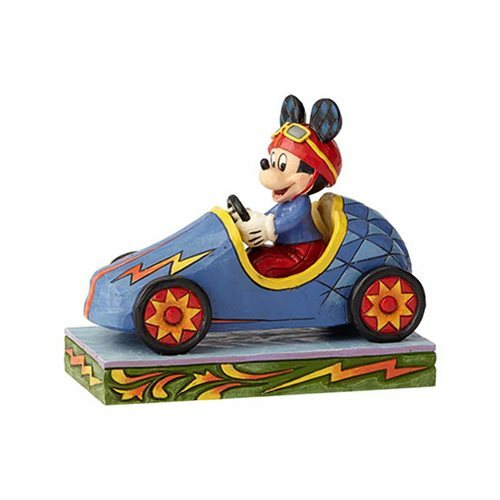 Measuring approximately 4 7/10-inches long x 3 9/10-inches tall x 2 3/5-inches wide in stone resin, the Disney Traditions Soap Box Derby Mickey Mouse Mickey Takes the Lead Statue by Jim Shore makes a fun gift for Disney fans and racecar fanatics alike. Collect this Disney Traditions Soap Box Derby Mickey Mouse Statue along with the Disney Traditions Soap Box Derby Donald Duck Statue and Disney Traditions Soap Box Derby Goofy Statue by Jim Shore for a lively display! Each sold separately. Enesco's Disney Traditions collection by Jim Shore combines the magic of Disney with the time-honored motifs of folk art.